14ymedio, Havana, 24 February 2015 — Short-duration detentions increased considerably in Cuba in 2014, according to the annual report published today by Amnesty International. The human rights organization, with headquarters in London, emphasizes that the situation with respect to freedom of expression, association and assembly, infringed on by criminal prosecutions for political reasons, did not improve. Amnesty International expects, nevertheless, that the announcement of the re-establishment of diplomatic relations between the Island and the United States may help produce a significant change in the matter of human rights. The report highlights the 27% increase in short-duration detentions last year, according to data from the Cuban Commission for Human Rights and National Reconciliation, which counted almost 9,000 brief arrests. 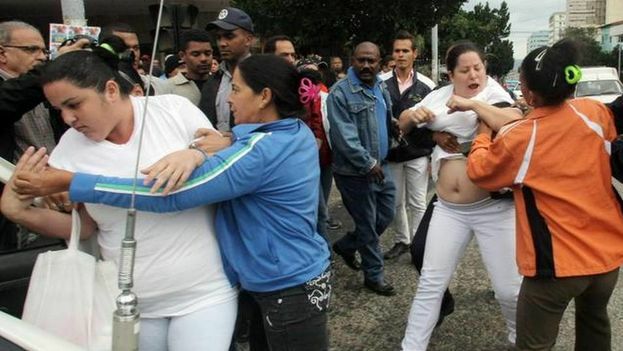 The Ladies in White organization suffers the most from this type of repression, although Amnesty International also mentions the arrests produced at the end of 2014 on the occasion of the Community Summit of Latin American and Caribbean States (CELAC). The annual report, which offers an overview of the human rights situation in 160 countries and forecasts trends in this arena for the next year, addresses the issue of the control that Raul Castro’s government exercises over all means of communication and the difficulties of accessing information on the Internet. Among the harassments that independent journalists have suffered, the organization cites the case of 14ymedio, which, on the day of its launch last May 21, suffered an attack on its web page. Since then this digital daily has been blocked on the Island. The report dedicates a special section to prisoners of conscience and notes that laws that classify “dangerousness” and the likelihood of future offense as crimes have been used frequently to incarcerate citizens critical of the Government. Also, they point to the restriction on travel outside of Cuba imposed on the 12 prisoners of the Black Spring who were released without a clarification of their legal status. Amnesty International appreciates the immigration reform of 2013 which has permitted Cubans to travel abroad but points out that the government has confiscated materials and documents from opponents and critics on their return to the Island. The international organization complains that Cuba has not yet ratified the International Treaty of Civil and Human Rights or the International Treaty of Economic, Social, and Cultural rights, both signed in February 2008. Also, the Government has not responded to the petition made in October by the special rapporteur on torture and other cruel, inhumane or degrading treatments and punishments. Cuban authorities have denied Amnesty International access to the country since 1990. Amnesty International stresses that 2014 was a “cruel” year in all of the Americas, characterized by outbreaks of protests and impunity for criminal networks. “Last year, insecurity and conflicts grew on the American continent. Protests exploded in several countries, among them Venezuela, Brazil, Mexico and the United States, often violently repressed by state forces. We also were witness to the tragic increase in violence by criminal networks that acted with total impunity,” Erika Guevara Rosas, director of the organization’s program for the Americas, asserts. “From the disappeared students in Mexico through the revelations about torture at the hands of CIA agents in the United States and the shooting of protesters by Brazilian police, 2014 was a shameful year in the whole region,” she adds. Amnesty International warns that, if significant structural changes are not put in place, the region will see an increase of protests and demonstrations, while organized crime and violence will continue devastating countries like Mexico, El Salvador and the English-speaking Caribbean. The organization notes as positive the peace talks between the Colombian government and the Armed Revolutionary Forces of Colombia (FARC) for the purpose of putting a definitive end to the continent’s oldest armed internal conflict. Nevertheless, the report stresses that at the end of last year both parties continued abuses and violations of human rights. As for Venezuela, the report insists that security organizations employed excessive force to disperse protests and emphasizes that dozens of people were detained arbitrarily and denied access to doctors and lawyers. Amnesty International nevertheless harbors a certain hope that movements in defense of human rights in the Americas may improve their form of organization thanks to the help of new technologies and social networks.